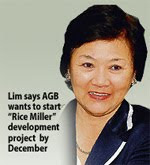 Property developer Asian Global Business Sdn Bhd (AGB) plans to start work on its RM300 million "Rice Miller" development in Georgetown's heritage enclave by December. The company's chairman Kate Lim told Business Times that AGB is currently awaiting approval from the Penang local authorities for its project which had to be scaled down, to comply with conservation guidelines stipulated by the United Nations Educational, Scientific and Cultural Organisation (Unesco). The mixed-development located at Georgetown's waterfront Weld Quay area will include a boutique hotel, upscale private residences and commercial units. AGB was one of four property developers that obtained approvals from the Penang Island Municipal Council for its projects, well ahead of the date when Georgetown was inscribed on Unesco's World Heritage List in July 2008. Together with Boustead Holdings Bhd, Eastern & Oriental Bhd and the Low Yat Group, AGB was told by the Penang state government that their proposed developments were jeopardising Georgetown's heritage status, because their height were over the prescribed limit. The Rice Miller project is located in the city's heritage zone, along with the Boustead Royale Bintang Hotel which is being constructed behind the general post office in Lebuh Downing. E&O is building an extension to its E&O Hotel while Low Yat had planned to build a 23-storey hotel on Jalan Sultan Ahmad Shah, both in the buffer zone. "After meeting Unesco officials who came to Penang in April, AGB decided to meet all Unesco's requirements, said Lim, "and we have now lost 50 per cent of our net sellable space". She said the original plan to build 11-storeys has now been scaled down to five-storeys. "We submitted fresh plans last month for compliance with Unesco's guidelines," she said, adding that the project is slated to be first permitted under Georgetown's new height limits for its heritage zone. Sitting on a 1.2ha site, the project is set to revive Georgetown's old port area and will be marketed as a piece of affluent real estate in the heart of the city. "As planned from the outset," Lim added, "we will be conserving the 60-to-100-year-old buildings at the site and re-using them for commercial and retail, including an old vacant godown." SENAI: Senai Airport Terminal Services Sdn Bhd (SATS) will launch the first of three “components” of the multi-billion ringgit Senai Aviation & Airport City project by year-end. Deputy chief executive officer Shahrull Allam Abdul Halim said the first component, on a 323.74ha site, comprised residential, commercial and hospitality amenities. The other two components in the mixed development project are an air cargo logistics centre and a high-tech park, each occupying a 404.68ha site. “The first component’s launch involves the commercial and hospitality segment while the residential side will take place when the time is appropriate,’’ Shahrull told StarBiz in an interview. He said the initial launch would cover a 12.94ha site, of which 10.52ha would be for the commercial precinct and 2.42ha for the hospitality section. “The hospitality component, comprising two hotel blocks and a convention centre, will be developed in three phases and the project will take 24 months to complete,’’ he said. The development of the hotels and the convention centre will come under Johor-based Tiong Nam Logistics Holdings Bhd, according to Shahrull. Shahrull said apart from factory outlets, the commercial area would also have logistics and warehousing facilities. “We want to position the commercial area as a regional wholesale centre to attract buyers from countries in the region,’’ he said, adding that an international wholesale operator with a similar operation in Dubai had decided to invest in the commercial project and would manage the wholesale centre while SATS would provide the land. 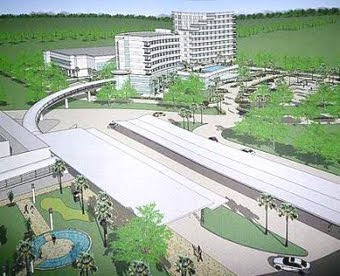 SATS subsidiary Enigma Harmoni Sdn Bhd, which is linked to billionaire Tan Sri Syed Mokhtar Al-Bukhary, has received approval from the Kulai Municipal Council for the airport city project. MMC International Holdings Bhd, a wholly-owned subsidiary of Syed Mokhtar’s MMC Corp Bhd, has stakes in Senai International Airport, Port of Tanjung Pelepas and Johor Port. The entire development, which is located next to the Senai Airport, also includes a Customs Inspection Quarantine Complex and will take about 10 years to complete. The project is estimated to cost about RM1.2bil with the Senai Airport Hi-Tech Park set to be the second high-tech park in the country after Kulim Hi-Tech Park in Kedah. Opened in 1974, Senai Airport is managed by SATS, which took over the operations of the airport from Malaysia Airport Holdings Bhd in 2003. Besides property, visitors to The Star Property Fair 2009 in Penang also have the opportunity to win attractive prizes such as Global Positioning System (GPS), MP3 portable media player and facial products. To win the prizes, participants have to look out for the ‘Lucky Catch Contest’ entry forms in The Star newspaper’s Metro section. Iriver (M) Sdn Bhd has sponsored RM5,000 worth of products for the contest, with its administration assistant Diana Ahmad saying the company was promoting its latest products. Fabulous Slimming and Skin Therapy Centre has also sponsored RM5,000 worth of cash vouchers for the contest. Its manager Winnie Lim said the company was rolling out its new product — The Power of Miracle Seed. “We hope to share the good news with everyone,” she said after handing over the vouchers to The Star’s marketing representative Lai Fuh Sheng at The Star Northern Hub yesterday. There are also 30 grand prizes to be won which include Blackberry phones, furniture and flight tickets to Bangkok. The three-day Star Property Fair 2009 kicks off tomorrow at G Hotel in Gurney Drive, Penang. PUCHONG: LBS Bina Group Bhd is confident of strong demand for phase II of its Town Villa at Taman Tasik Puchong based on the response to previous launches of property units under its Affordable Home Series. Managing director Datuk Lim Hock San said in a statement he believed there would be significant demand for affordable residences in this locality. Phase II, comprising 96 town-houses, was launched yesterday in conjunction with the unveiling of the Town Villa show unit. LBS said 97% of the 104 units offered under phase I were sold within three weeks of its soft launch. Town Villa, which occupies 2.2ha of Taman Tasik Puchong’s development land of 64.8ha, comprises 330 townhouses with a total gross development value of RM62.3mil. The units are priced from RM179,000 to RM267,000. For its Affordable Home Series, LBS has extended its LBS Hassle Free Hone Ownership programme that allows purchasers to make a low down-payment of RM1,000 while LBS will absorb the legal and disbursement fees. If you are concerned about where you want to go in life or even the direction of society as a whole, first appreciate where you are coming from. To provide this understanding is a basic objective of the Malaysian Heritage Trust. Forget the tourism spin-offs and the fact that many older buildings might be prettier than their modern counterparts. That’s not the point of conservation; it’s a secondary issue. In any case, beauty is a subjective quality. When it comes to town planning, time travel is quite easy. To go back in time, Yangon is a very beautiful example of a city that has not yet been ravaged by development, a virtual time warp. Prague under the communists was once similar. Florence and Venice have retained their integrity, and little new development has been allowed in Paris up till now. If you want to see the impact of allowing development on a controlled basis, then contemporary cities such as KL are a good example, along with, say, Budapest, Sydney, Brisbane and so many others, depending on the degree of control that interests you. There are cities such as Leningrad and Bucharest spoilt by the growth of really ugly public housing. There are others where an effort has been made to make public housing a cultural asset (erm ... give me time, there must be one ...). It is interesting to observe the impact of cities putting in the public transport early (London, Sydney) or racing to catch up (KL, Dubai). For a trip into the future, go to the United States. In fact, I just came back from Los Angeles (LA). It’s pretty depressing. Here is a huge urban metropolis filled with some of the smartest people in the world, who have allowed their living conditions to deteriorate to a very uncomfortable level. Certainly, bold and expensive steps are being taken to preserve the air quality in LA but the sheer quantity of vehicles has turned the roads into “traffic sewers”. When I took the keys to my rental car, the Hertz lady muttered darkly “beware of the 405”. I soon learnt that this wasn’t a triad, but a constipated arterial highway. LA has many splendid features – the beaches, the hills softly burning in the sunset, the colourful pan-handlers. But how can you work in a city where the traffic is largely paralysed at peak hours? And of course, the fundamental question is, what is society’s tolerance level? My friend in lovely, low-density scenic San Diego wouldn’t move to LA even if promoted. This is surely a supreme sacrifice for an American. He can’t be alone in this view. So, how long will it be before thousands, or millions, choose not to live there? Or will the rich move out and leave the poor behind, or vice versa? What impact do those possibilities have on the way other cities – even KL – should be developed? California is the world’s fourth largest economy, ironically suffering high unemployment and insufficient funds to keep all its schools open. LA is the way of the future if you allow unbridled development and vehicle use. Is it our future, too? The world is growing and so are most of the cities in South-East Asia. It is only a matter of time before these problems begin to threaten KL, Penang, Johor Baru, Kuantan, Kuching and Kota Kinabalu. The soft option, of course, is to keep approving new development and tacking on infrastructure as and when public interest raises its voice. The man in the street, inured to the daily grind, would not expect much more. But 2020 is only one more property boom away. Maybe it’s time to raise our sights even higher, and envision exactly how we want our grandchildren to live. And maybe do something about it? HONG KONG: Hotel group Marriott International announced yesterday it was planning 21 new hotels in Asia, despite the impact of the global economic slowdown on travel and demand. The company has 37 hotels under construction across the region, meaning that it will have built 58 new hotels by 2013, creating 24,000 jobs. The 21 newly announced hotels include two luxury JW Marriott hotels in China, 10 Marriott hotels in China, the Philippines and Thailand, two Renaissance Hotels in China and seven Courtyard hotels in Cambodia, China and India.